Tripod Picking Ladders are widely used in the horticultural industry to pick, prune and thin tree crops. Maximising picking efficiency, Easy to transport, Safe to work from, Built for reliability. AIM Tripod Orchard Ladders have become the trusted ladder for use in the horticultural industry. Synonymous with quality, the ladders are used not only to harvest tonnes of fruit every season from the Australian food bowl, but also for pruning and thinning across a range of crops including apple, pear, plum, stone fruit and cherries. 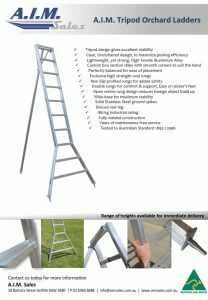 AIM Ladders are Australian made for use in the harsh orchard conditions. The tripod design allows pickers to be positioned closer to the tree, therefore maximising reach, whilst the single back leg allows pickers to face the tree.